The 24 metre explorer motor yacht Eighteen 2, listed for sale by Jim Acher at bluewater, has had a €1,300,000 price reduction. Built in steel to an in-house design by Van Der Heijden, she was delivered early in 2016 and is virtually new, having clocked up only 70 hours on her engines since delivery. Accommodation is for eight guests in four cabins consisting of a master suite, VIP suite and two twins, one of them convertible to a double. All cabins have entertainment centres and en-suite shower facilities. In addition, there are quarters for two crew on this yacht for sale. The main deck saloon has L-shaped seating to port, a bar and an entertainment centre including a Samsung flatscreen television and a Sonos sound system. 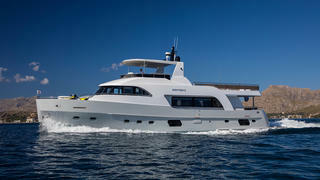 Forward is a dining area with seating for eight guests, while further forward still the well equipped galley hosts a dining table for informal snacks. The large aft deck has an al fresco dining area with a table and chairs along with a bar conveniently close to hand. Up on the flybridge is built-in upholstered seating, an electric grill, bar, ice maker and a Jacuzzi. The aluminium hard top has a removable drop-down transparent PVC enclosure to protect against the worst excesses of the weather. Twin 850hp Iveco engines give her a cruising speed of 8.5 knots and maximum speed of 13 knots. Lying in Mallorca, Spain, Eighteen 2 is now asking €3,500,000 with VAT paid.